War remains the dominant cause. A full 55 percent of all refugees listed in UNHCR’s report come from just five war-affected countries: Afghanistan, Somalia, Iraq, Syria and Sudan. The report also charts major new displacement from Mali, in the Democratic Republic of the Congo, and from Sudan into South Sudan and Ethiopia. “These truly are alarming numbers. They reflect individual suffering on a huge scale and they reflect the difficulties of the international community in preventing conflicts and promoting timely solutions for them,” said António Guterres, UN High Commissioner for Refugees and head of UNHCR. 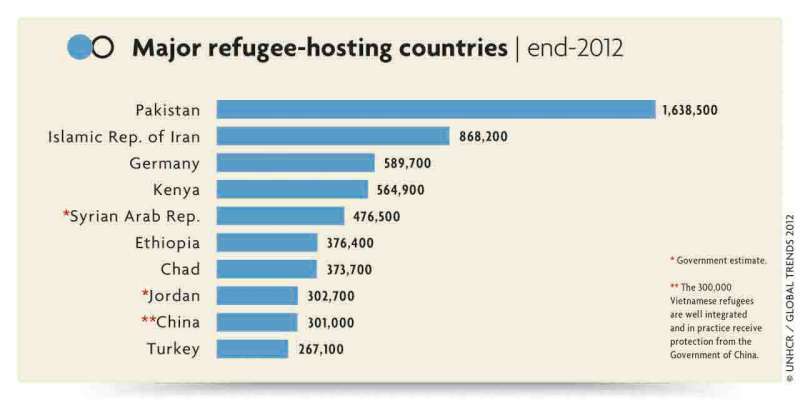 Also evident is a continuing gap between richer and poorer countries in hosting refugees. Of 10.5 million refugees under UNHCR’s mandate — a further 4.9 million Palestinian refugees fall under the mandate of its sister-agency, the UN Relief and Works Agency), half are hosted by countries that have a per capita GDP of less than US$5,000. In all, developing countries host 81 percent of the world’s refugees compared to 70 percent a decade ago. Last year saw little change from 2011 in the rankings of the world’s major refugee hosting countries. Pakistan continued to host more refugees than any other nation (1.6 million), followed by Iran (868,200) and Germany (589,700). Afghanistan remained the world’s top producer of refugees, a position it has held for 32 years. On average, one out of every four refugees worldwide is Afghan, with 95 percent located in Pakistan or Iran. Somalia, another protracted conflict, was the world’s second largest refugee-producing nation during 2012, however there the rate of refugee outflow slowed. 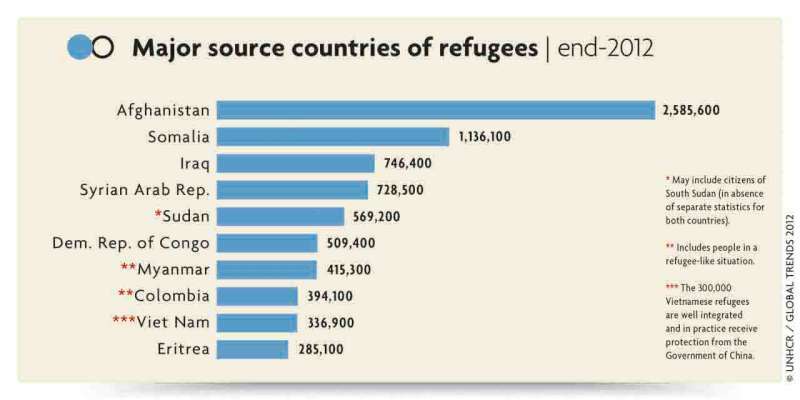 Iraqis were the third largest refugee group (746,700 persons), followed by Syrians (471,400). Assembly President Jean-Claude Mignon has marked World Refugee Day by expressing his concern at the “humanitarian disaster” in Syria. “The drastic situation of the Syrian refugees is constantly worsening and has reached an unprecedented level of suffering,” the President of the Parliamentary Assembly declared. “ A million and a half Syrians have fled their country – it is an outright humanitarian disaster! “Failing a political agreement to resolve a situation which has lasted far too long, the humanitarian crisis is stalemated and will only make the trauma more severe and profound for the refugees. “Certain groups of refugees are naturally more vulnerable than others. Over half a million children, uprooted, disoriented, their schooling broken off, sometimes separated from their families, are paying the heaviest price for the conflict. “Very often they flee with only their mothers, aunts or grandmothers who are themselves a vulnerable group, especially in the event of pregnancy. Mignon’s call to European governments to show greater solidarity with the plight of refugees is echoed by Olivier Beer, the Strasbourg-based UNHCR Representative to the European Institutions.